NO HIRED TEACHING FACULTY - The strength for the success lies in the strong hands of the educationalist so for that all the classes are under Mentorship of Mr Rahul Pandit. Industry Exposure - Visiting faculty from companies like Microsoft, Infosys, Wipro, RBS. Exposure on Real Time application Systems having different Frameworks applied. Workshops:- We regularly conduct Workshops on latest technologies, that intend to enhance knowledge of students on these latest technologies. 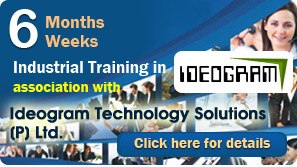 Dual Certifications - Students will Get Industrial Training Certificate from Ideogram Technology Solutions [P] Ltd. And a Course Completion Certificate in Microosft.Net from Actit Technologies. Free Domain Name and Hosting - All Student will be Getting free Domain Name and Web Hosting for One Complete Year.